Bacteria are tough. They can inhabit acidic hot springs, radioactive waste, deep ocean volcanic vents…and your food conveyor. In the Battle of the Bacteria, every day involves another Seek and Destroy Mission. The problem is, if you can’t seek, you can’t destroy. That’s where food conveyor clean out ports come in. 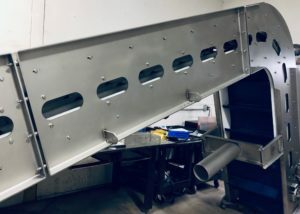 Basically, clean out ports are openings in the side panels of the conveyor at specific intervals which allow access to the inside of the system, specifically the carryways, underside and return side of the belt as well as the pulleys and sprockets that drive the belt. These are all prime hiding locations for bacteria. 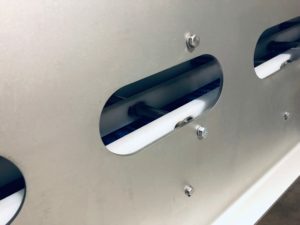 Sanitation tools are inserted into the ports for more thorough saturation of the sanitation solution as well as visual inspection and verification of complete coverage. This is a vast improvement over washing only from the top or underside in a “spray and pray” approach. Cleaning is usually done while the belt and mechanical parts are moving, so everything receives a complete washdown. This can be a concern for safety. Naturally, moving parts can cause problems if not treated with respect. Keeping safety in mind and to satisfy different levels of safety precautions, we offer a variety of clean out port options. Open ports offer free access to they belt at any time, and slotted ports provide a visual reference for maintenance and sanitation when cleaning or maintenance is required. We can also provide covers, which bolt on over the port, limiting admittance to the port until a safety or maintenance worker removes the bolts. Another version is hinged so that the port is covered under normal operating conditions, but sanitation crews can fold back the protective door for the cleaning process. With our in-house laser cutting system, we can also custom cut any size or shape of port to meet any customer’s unique specifications. Whenever we design a project that involves movement of unpackaged product (meat, poultry and cheese), we recommend clean out ports. Not only do they provide more complete sanitation, but there is also a tremendous time-savings that can be realized in the daily cleaning process. 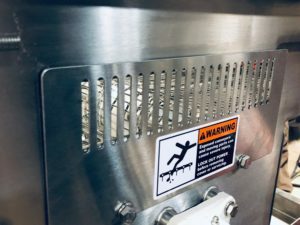 With many conveyors, clean out ports make CIP (cleaning in place) possible, avoiding costly disassembly and assembly time. But ultimately, it must meet the safety requirements of your specific facility, so always check in with a Safety Engineer first. If you would like more information about how clean out ports can support your sanitation efforts and even enhance your bottom line, please contact us.